Gerovital (GH3) is the precurser of modern anti-aging drugs. It was first introduced to the western world in the early 1950's by its inventor, Rumanian gerontologist Dr. Ana Aslan. It dilates and cleanses blood vessels, facilitating improved circulation to all parts of the body. Numerous conditions of aging are caused or accelerated by impairment of circulation. 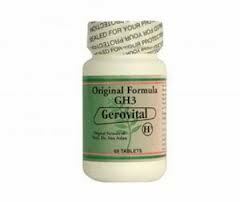 Poor kidney function, senility, angina, arthritis, poor skin tone or elasticity, varicose veins, poor lung capacity and other conditions may benefit by taking Gerovital. Procaine hydrochloride, the main active ingredient of GH3, is created by combining two, water soluble B-vitamins: para-amino benzoic acid (PABA) and diethylaminoethanol (DEAE). Both are found within the body and are important for good health. Clinical trials have established that GH3 is a potent anti-depressant and brain tonic and can arrest or reverse the symptoms of aging, including hair loss and greying, and the wrinkling and hardening of skin. It helps to re-invigorate sexual function, and help eliminate anxiety and insomnia. Tierra GH3's special formula can help reduce free radical activity preventing damage to DNA and cellular membranes. The enhanced cellular bioenergetics of GH3 can help optimizes ATP, the body's energy molecule. It also helps to normalize brain neurotransmitting balance; while also potentially helping to normalize chronological rhythms. Animal Free and Gluten Free! 1 tablet 1 hour before 2 hours after meals twice a day (at least 6 hours apart).